Looking to hire a local drywall contractor for installation, finishing, repair or texture work on walls and ceilings in your home? 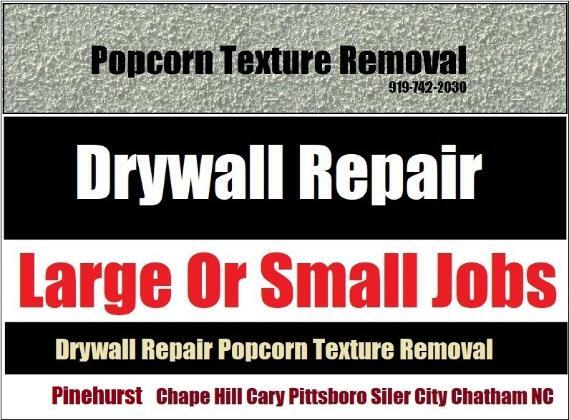 Call Drywall Specialist for affordable prices and a free estimate on large or small jobs. Nail pop, poorly finished drywall joints, loose cracking joint tape or metal corner bead, hole repair, crack repair, wet water stained ceilings, loose flaking popcorn texture can be repaired, mached, blended or completely removed and finished smooth ready for paint. 27207 Bear Creek, 27559 Moncure, 27312 Pittsboro, 27344 Siler City.